Many GLP consultants are now using the new Transformations™ card deck for students and clients, so that they can self-diagnose their leadership action-logic and explore both patterns in the group and environment. Transformations™ offers a open-hearted and bonding way to explore individual and common approaches to life and leadership. Transformations™ is part of the Leadership Explorer™ series from the Center for Creative Leadership and is being developed in collaboration with Global Leadership Associates. The Transformations™ Card Deck, along with the associated Catalyst cards, makes a major and wonderful contribution to our tools for communicating the liberating potential ….. The Transformations™ Card Deck, along with the associated Catalyst cards, makes a major and wonderful contribution to our tools for communicating the liberating potential of adult development theory and the practice of Collaborative Developmental Action Inquiry (CDAI) to leaders and to youth worldwide. Developmental theory is perhaps the single most hopeful of all social science theories because it offers a map of how any of us can repeatedly question the assumptions about ourselves and the world that have heretofore blinkered our daily perceptions and made us less aware, less effective, and less powerful than we have the potential to become. 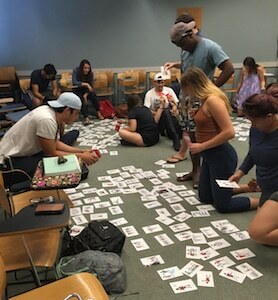 With its low cost, entertaining art work, and wide usability across language differences, the Transformations™ card deck now allows a much wider public to introduce itself to this theory and use it to continue the development in adulthood that educational institutions are supposed to foster in our youth. 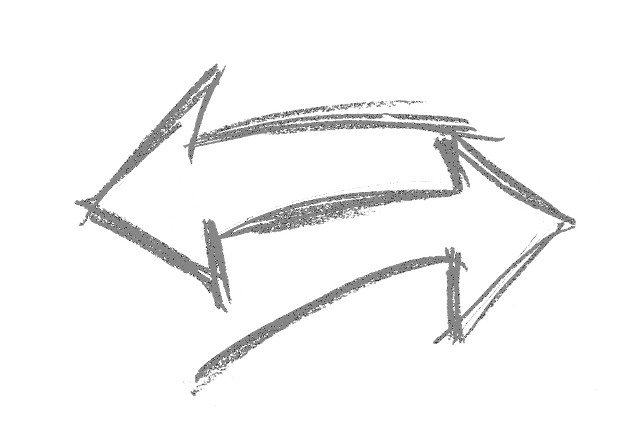 During its first generation, adult development theory was both generated and tested by research relying upon psychometric measures such as the Global Leadership Profile (GLP), which were gradually tailored for practical use by organizational clients. Workshops trained Certified GLP Coaches and consultants who worked with executive teams and middle managers, helping whole organizations to transform and validating the proposition that only CEOs who evolve to the rare, late leadership action-logics are reliably successful in supporting positive organizational transformation. In its second generation, the GLP will continue to function as a crucial vehicle for providing objective data about a person’s center-of-gravity action-logic, as well as providing leverage for further development. Now, however, the Transformations™ card deck permits much wider audiences who know nothing about adult development theory when they first play with the cards to choose cards in response to any number of questions and concerns, only later learning what action-logics they have self-selected. In the CDAI approach to social science, the cards represent a first-person, subjective method of estimating one’s own center-of-gravity action-logic that can begin conversations about how different members’ action-logics play out in organizational life. These estimates can increase one’s motivation to learn more about the strengths and relative blind spots of one’s own current action-logic by taking the GLP. The Transformations™ card deck has evolved from the decades’-long collaboration between Bill Torbert and Elaine Herdman-Barker at Global Leadership Associates and members of the Center for Creative Leadership (Chuck Palus, John McGuire, and the more than two dozen other CCL’rs who have participated in Action Inquiry & Global Leadership Profile workshops). Earlier evidence of our collaboration can be found in the McGuire, Palus, and Torbert 2007 chapter “Toward Interdependent Organizing and Researching” in the Handbook of Collaborative Management Research, and in McGuire and Rhodes 2009 book Transforming Your Leadership Culture. For the card deck, Elaine first began imagining and hand-producing illustrations of the different action-logics, and CCL’s Bruce Flye persevered through many iterations, as we sought to create universally recognizable, amusing archetypal portraits of different characteristics. If the first generation of work on Collaborative Developmental Action Inquiry put primary emphasis on the serious philosophical and empirical grounding of this approach to social science theory and practice, we can perhaps say that the Transformations™ card deck puts primary emphasis on the playful side. Our early experiments have shown that it can be used within families as well as within organizations. Do enjoy your encounters with this card game! There are innumerable ways of using it to focus on innumerable topics. Flexible and easy to use, Transformations™ images work well in coaching, leadership and culture development. We have just started using these and they are fabulous for accelerating reflective growth conversations for individuals working together in larger workshop groups. Just wish I had something like these 13 years ago. Learning to trigger deeply reflective conversations about leadership and patterns in the environment is an integral part of GLA’s certification workshops. 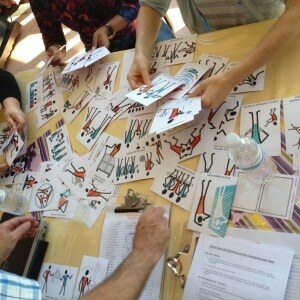 The Transformations™ card deck, with its myriad images, is a breakthrough in vertical development. Life affirming, fun and honoring of each individual, as he or she chooses which ones best illustrate a past leadership practice or a future aspiration. More on Center for Creative Leadership site. The card images help people to tell their own story, hear the development stories of others and so better understand how, in everyday life, our action-logics play out. Part of the work with Transformations™ is discussing group histories, patterns of leadership and shared visions. Prompting questions such as how to create a shared and valued culture in the organization or community? The card deck is opening the way to doing this work in Africa and South America, China and Japan, not to mention larger audiences everywhere. ▪ Taking a new look at patterns in the group, organization or society; exposing what is valued or shunned. Transformations™ can be used as part of a deep exploration of the GLP or in an introductory way. To place your order please go to our SHOP through the link to the right. *Your cards will be shipped from the US.